non-existent completely under "state"dyfs supervision." No one shall possibly"understand" it. UNLESS IT HAPPEN TO SUCH PERSON. CALL AS MANY LAWYERS AS YOU CAN. Founder,student staff member,melendez had ensure that her suit pro-se(self file)Was filed timely,as her daughters. ext.102 Now she continue to prepare one day,with her studies,for a juris doctor,(law degree) in due course,after she implement one day,law school,her vision,is not in any way unclear,when it come to the severe damage,to her once happy girls,her family. So many reach our dedicated-hard working committed hands on trained unique-women staff weekly when violated in NJ-Bergen County Family Superior Court by DYFS worker who clearly has violated one's constitutional right.ext.102. The Falsely accused individual in Bergen County don't even know how to curb/RID DYFS of one's life,once and for all to protect the future child(ren)one might have,and or grandchildren. 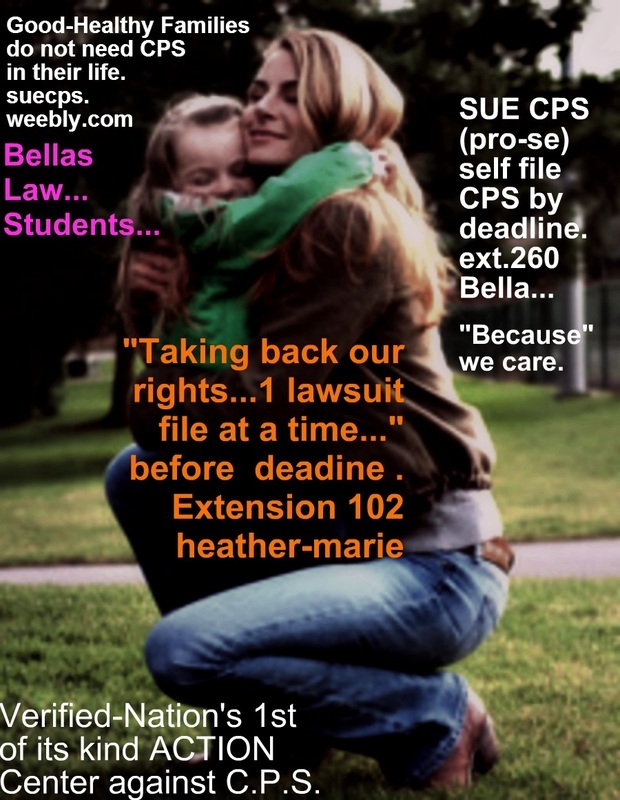 Many contact BellasStudent/SUE CPS Pro-se research 1-on-1 student research online virtual clinic whose currently facing DYFS violation(s)in Union County to Bergen County,Essex,to Jersey Shore,premise on dyfs cps worker repeatedly one's Guaranteed Rights of the most innocent..."
Violations involving the non-adherence to state DCF policy/protocol. "I CAN SUE and I WILL SUE." There was no way after what was learned in repeat fashion involving her girls and her own self per violation was going to NOT be filed in the U.S.DISTRICT FEDERAL CT.
State agency like D.Y.F.S.has intimidated so many we are learning for decades.But not our leader/owner/boss.She took ACTION. DYFS has to abide by such protocol/procedural et;al just like any other county in NEW JERSEY. Superior Family Court in Bergen County(are allowing DYFS to violate,by leaving child in harm's way or falsely accusing you be sure to begin the extensive process)in making sure your suit is TIMELY filed.